Equal Money is an approach that has been formulated in response to the humans proven inability to take care of life on earth in all its forms. Taking into consideration the state of the world as it currently exists where war, abuse, exploitation of resources and survival of the fittest is accepted as human nature. The redesigning of this nature has become the pivotal point that will decide the future of the human race. 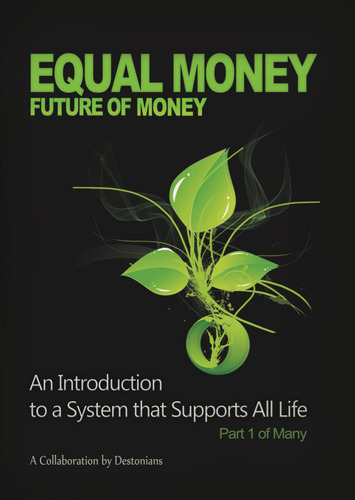 To educate yourself and understand the science and mathematics of Equal Money is vital as the simplicity of this new financial system will astound you. Are you free enough within your self-definition to consider an answer for the world that is in conflict with all the accepted paradigms of human history? Are you aware of the urgency that is necessary in finding a new way to deal with the earth’s problems? Would you agree with us as a starting point, that life has intrinsic value, that has not been affectively protected and given opportunity to explore itself within a system that gives so abundantly? This Volume is just a start and will not answer all your questions. There is a forum where you can ask your questions. There will be many more volumes as the dimensions of life on earth is varied and the variety must be considered in exploring what man can become, when what’s best for all becomes a birth right. There are many videos that give guidelines as to how the Equal Money as a system is envisaged to function. We have made a commitment to ourselves as life to find and define a new system that functions practically in a way that is best for all from birth to death. We invite you to participate in this grand new journey. Electronic delivery: Pay & download immediately. FREE Andrea Rossouw: WHAT HAS HIV AIDS SHOWN US ABOUT OURSELVES? WHAT THE FAQ IS EQUAL MONEY?